Angela's Guest House - Stunning & Private Apollo Bay Accommodation - Let us be your home away from home. Enjoy a clean and comfortable stay second to none. 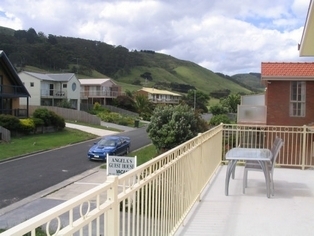 Only metres from the golden sands of Apollo Bay, only a 3-4 minute walk, Angela's team offers you a B & B Alternative. All of the suites are totally private and are for 2 guests, except for the family rooms that contain 4 guests. We are in a quiet location. We are lucky to be positioned at the base of the famous Marriners Lookout, which exemplifies such a panoramic view in both directions of the beautiful Otway Coastline. Angela's GuestHouse is only 200 metres from the beach, a 2 minute drive or a 15 minute walk to the cafe latte strip, cafes, restaurants and hotels in the Heart of Apollo Bay Main Centre. The rooms are large, spacious and private and each are well equipped with their own private balcony and large ensuite bathroom. Most also contain a separate bath-tub to unwind in after an adventurous day exploring. They are all equipped with the basic essentials that are needed and either face the ocean or the hillside. All rooms contain a bar fridge, microwave, tea and coffee facilities, tv and dvd players, all linen, as well as toiletries. There is also FREE Wifi, FREE Parking and FREE Movies. Breakfast is available at a small cost. Guests that have stayed with us describe it as a very friendly, comfortable & homely place. For 2 Guests Only. Private Large Balconies with part Ocean Views. Private Large Ensuite Bathrooms with separate bath. Microwave and Free Wifi, Tea/Coffee Facilities, All Linen & Towels, Off Street Parking. For 2 Guests Only. Private Large Balconies with stunning Hillside Views. Private Large Ensuite Bathrooms with separate bath. Microwave, Fridge, New, large TV and Free Wifi, Tea/Coffee Facilities, All Linen & Towels, Free Off Street Parking. Reception is manned from 8am to 9 pm. Register at check-in. Check-in is from 2 pm til 9 pm. Rates are for up to two (2) people. About 1 km or 1 minute drive east (melbourne side) from Apollo Bay Town Centre. Turn left into Mariners Lookout Rd and we are the second street on the left. We have insight to activities available. Scenic Flights, Nature Walks, 12 Apostles, Otway Fly Walk, Waterfalls, Lookouts, Seal Cruises, Nightly Glow Worms Tours, Great Ocean Road.